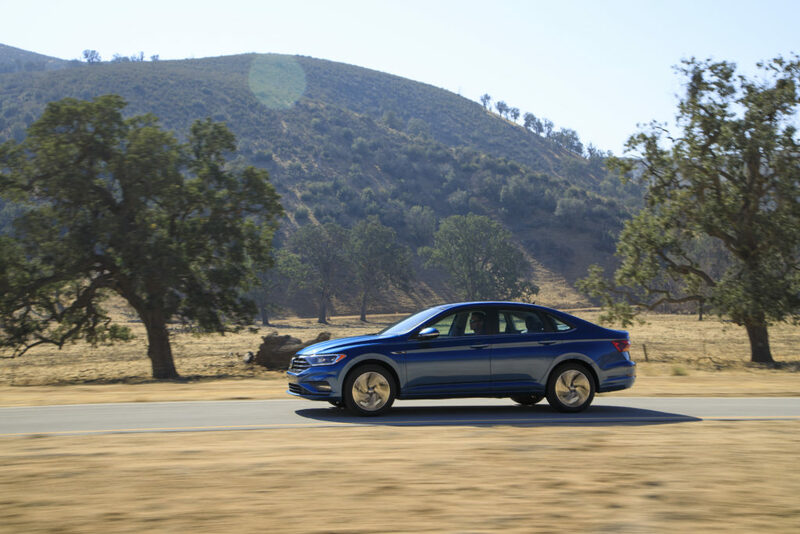 The 2019 Jetta grows minimally in nearly all exterior dimensions while it carries a shape that looks much larger than the 2018 model. The rocker panel’s lower edge is nearly in line with center cap of the wheels while a large tire-to-side panel gap and horizontal bars up front that extend from the grille into the horizontal LED daytime running lights are styling features that drive home that message. Inside, a raised seating position, a tall dashboard, and a generally soft suspension give off the impression of large vehicle from behind the wheel too. Horizontal lines are the dominant styling theme. Good ideas like LED rear lighting are mixed with bad ones like large faux exhaust outlets that aren’t not fooling anyone. The Jetta’s interior is plenty roomy yet the design’s focal point is clearly on the driver. A quick reacting 8-inch infotainment touchscreen is sharply angled and closely positioned for accurate screen selections. The steering wheel features soft leather and a comfortable shape while the layout, feel, and design of its multi-function controls are equally impressive for this price range. Beyond the steering wheel is another outstanding feature just for the driver where a high resolution 10.25-inch digital display takes the place of a traditional combi-meter. To many, this will be the wow-feature of the car. 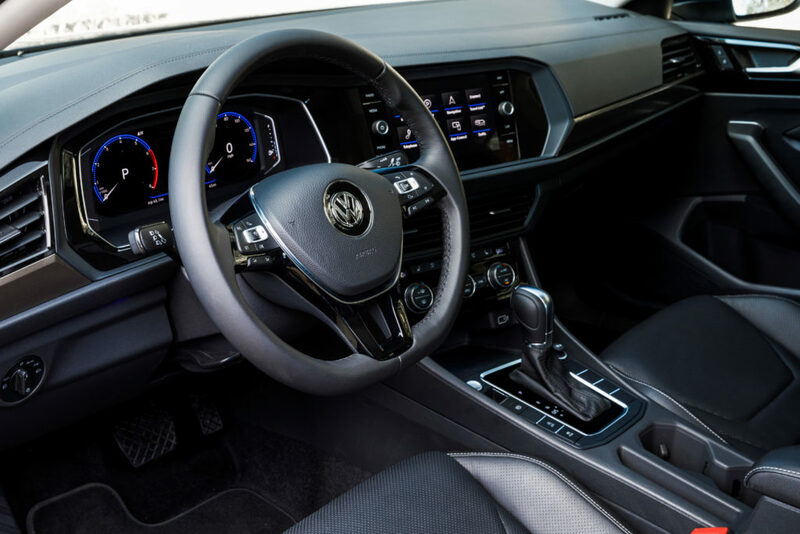 Deeply padded elbow surfaces and a long seat cushion are also notable touches that exemplify the detailed approach of VW’s engineering team. The steering wheel is fantastic in feel and layout. The center display is sharply angled towards the driver – a boon for making accurate screen selections. 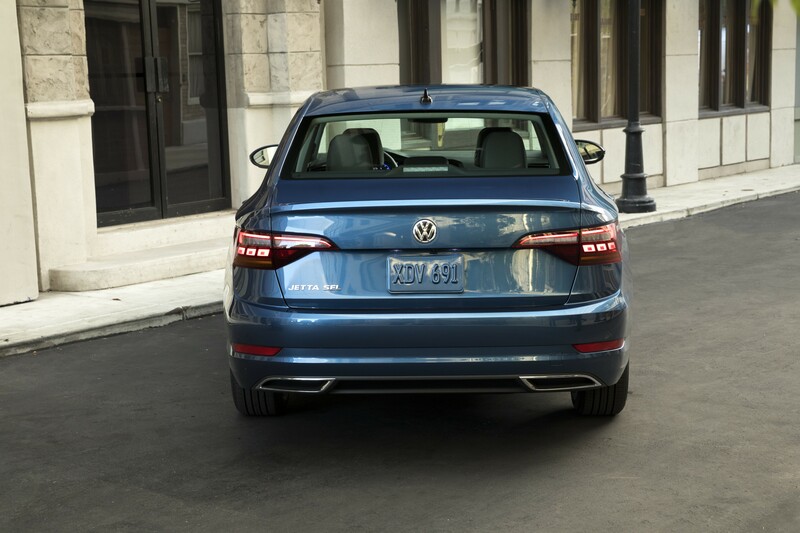 Although the rear legroom is technically less than the outgoing generation, it remains plenty spacious while a 60/40 folding seat back allows the Jetta to accommodate long items. Dynamically, the Jetta falls short of the high marks it earns with its interior materials and ergonomics. 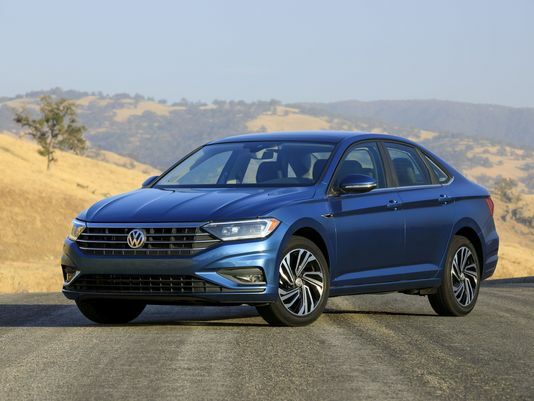 The Jetta’s new 1.4-liter four-cylinder engine is weak off idle and feels like the small engine that it is, at least until the turbocharger picks up to speed. The same story is told on the highway, where patience brings strong power – easily keeping up with traffic in 75 mph zones – but in when a quick burst of speed is needed, the powertrain response is delayed until the transmission and the turbocharger wake up. It can feel like an all or nothing game, going from a calm and quiet ride to an abrupt change in acceleration and added noise. Body motions are well controlled and broken pavement is quietly absorbed around town while large dips and bridge gaps at higher speeds reveal the soft tuning of the suspension. Here, the chassis needs a moment to compose itself before the next event. It makes for a wonderfully smooth highway ride but it might be a bit of a let down to those seeking a traditionally European-tuned ride. There are five trim levels: S, SE, R-Line, SEL, and, SEL Premium. 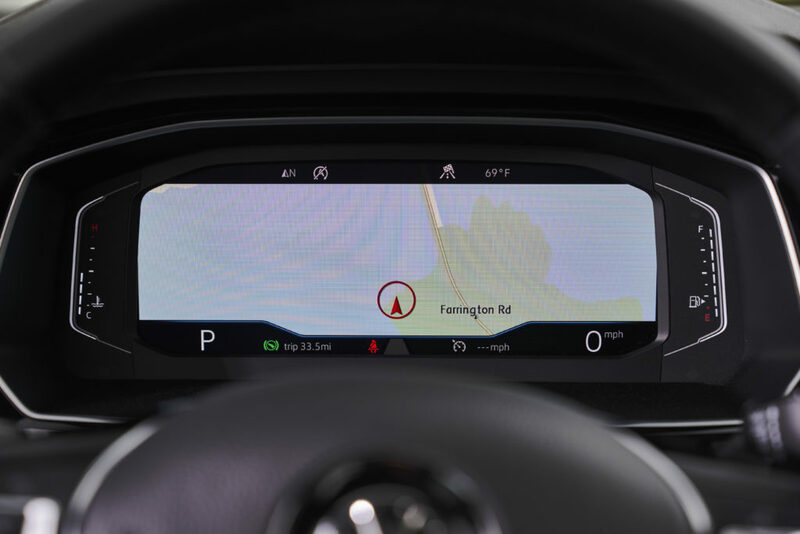 At $19,440, the S trim features 16-inch alloy wheels, all-around LED lighting, a six-speed manual transmission (an eight-speed automatic transmission adds $800), a 6.5-inch touchscreen, VW App-Connect (a subscription service), and, through the available Driver Assistance Package for $450, forward collision warning with automated emergency braking. The SE trim begins at $22,165 and adds modern features like keyless access with push button start, a large sunroof, dual-zone automatic climate control, aforementioned leather steering wheel, and heated leatherette seating surfaces On the safety front, the SE gains rear cross-traffic alert, and blind spot monitor. For a more of a sporty attitude, the R-Line ($22,995) builds off of the SE feature content and adds black painted grille trim, mirrors, and rear bumper skirt, R-Line steering wheel badging and unique stitching on the seats. On the dynamic side of things, the front axle receives a brake-activating torque transfer system to help maintain front end grip while enthusiastically accelerating in a turn. The SEL trim $24,415 reverts back to the SE’s feature lineup and adds the digital cockpit display, an 8-inch touchscreen multimedia display, and BeatsAudio premium sound that includes a 400-watt amplifier pumping sound through 9 speakers. 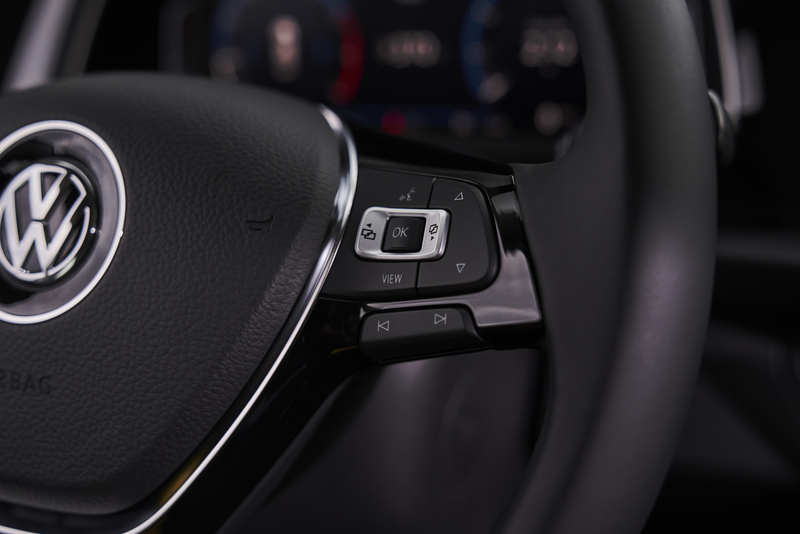 Active Cruise Control and Lane Keep Assist are added active safety features to help make those tedious highway miles a bit less stressful. At the top of the lineup is the SEL Premium at $26,945 and uniquely includes 17-inch wheels, leather seating with heating and ventilation. Bottom line: For 2019, the Jetta brings added value across the lineup and although it’s not an enthusiast’s choice, we can expect VW to follow tradition and roll out more sport-focused variants in the future, and possibly even a more balanced powertrain. Then, at last, VW might have cracked the code for the Jetta’s success in the U.S. market. 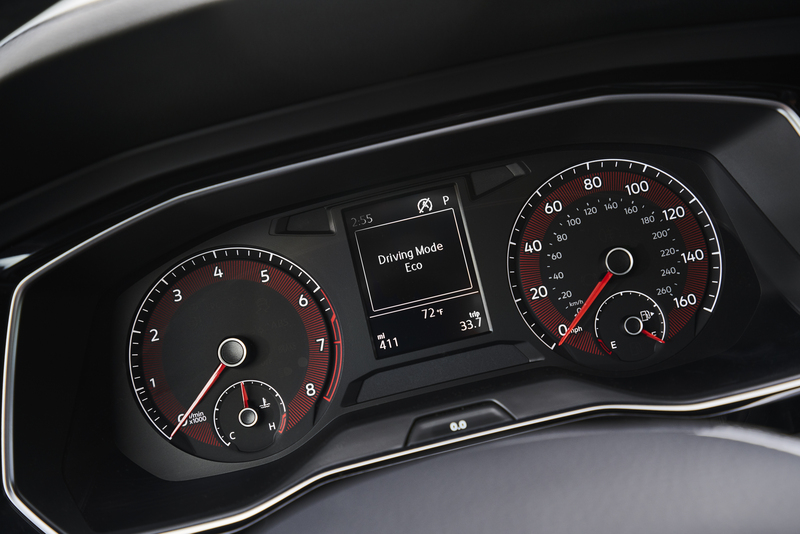 The S, SE, and R-Line receive standard gauges. 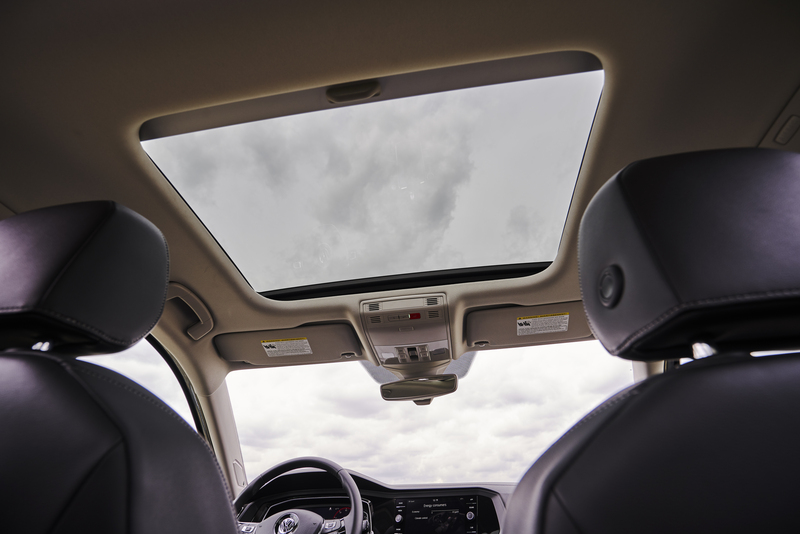 The large sunroof is standard on the SE trim. One of the colors of the much hyped interior ambient color selection. Actually, there are just 9 other colors from which to choose. The steering wheel is an area where the Jetta feels richer than its price alludes. One of the possible configurations with the large digital display.